It's becoming more and more clear that ranking reports are no longer reliable. Users are noticing personalized SERPs more and more and they're catching on to obvious inaccuracies generated by traditional ranking report software. These inaccuracies are caused by differences in query IP, query data, account status, web history, personalized settings, social graph and/or other. As a result, there is a growing shift away from rank report software to analytics for accurate SEO measurement. Prior to personalized search results, SEO relied heavily on ranking reports in order to measure SEO campaign performance. SEOs create "ranking reports" with software that submits automated queries directly to search engines, a.k.a. "scrapes search engine results." Despite the fact that automated queries are against Google Webmaster Guidelines, waste energy and cost Google millions of dollars each year to process, scraping search engine results is still a popular practice. Obviously it’s in the engines best interest to take steps to prevent these queries. Analytics software on the other hand is different, it works independently of search engines. Analytics relies heavily on code embedded within pages as well as human interpretation of data. Until recently, analytics software has been used only to “tell a story,” but not for the precise measurement SEO requires. Site analysis focuses on trending and establishing a “comfort level” with data determined to be "good enough" by the analytics specialist. Analytics platforms are designed for anyone to use, specialist and non-specialist alike. In many cases, analytics specialist themselves have little analytics experience, expertise, knowledge about how search engines work or an understanding of searcher intent. How can we expect anything different, when WAA itself still doesn’t teach things like transactional queries? "To optimize scent trails, make sure that when the intent is transparent, the scent trail on any chosen term matches that intent. It doesn't matter if the trail starts with PPC (pay-per-click) or organic search. Prospects usually hope to find one of two things: the answer they seek or a link that takes them to the answer." Analytics tracking code is usually implemented by URL without consideration for user path, intent, source or origination. In most cases the implementation is performed by someone other than the analytics specialist interpreting the data. According to some estimates as many as 45% of pages implemented with Google Analytics contain errors. Conversions from organic SERPs are the most difficult to track back to the original referrer. To compound that problem, site issues often prevent even flawless analytics implementations from reporting. Analytics failures are costly, often go unnoticed and undetected because NOTHING is in place to report when analytics doesn't report. - Even if Avinash himself, implements Omniture and Google Analytics tracking code on every page of your site, users entering from SERPs via 301 or 302 redirect won’t be attributed as “Organic.” According to Google, "If your site uses redirects, the redirecting page becomes the landing page's referrer. For example, if a user searches for a specific keyword, such as 'used books' on Google, there will not be any referring data showing that this keyword was searched on Google. Instead, the referral will be shown as the redirecting page." - High traffic major converters or blank pages that send users to a competitor? Either way, nobody will ever know because these pages lack analytics tracking code. URL naming conventions for most sites follow a specific pattern. Use the site operator to quickly spot check for URLs that seem out of the ordinary to be certain they include analytics tracking code implementation and aren't redirected. It's pretty common to find legacy pages from older versions of sites indexed. - If these folks are quick evaluators, analytics tracking code might not execute before a new page loads and this SEO conversion might be credited somewhere else. Analytics won't measure landing page load time even though it's a highly important metric for users. Flash or otherwise, pages like these always have issues when it comes to tracking organic conversions. - If your site goes down chances are you'll never know because analytics reporting goes down as well. Using a website monitoring service is always a good idea, just to be sure that conversions really are down and not your entire site. Takeaways, until SEO expectations are more clear to the analytics community, SEOs should insist on performing SEO analytics audits as usual. When hiring analytics specialists, look for applicants who are willing to address websites from the user perspective and outside of analytics. Folks willing to question data accuracy and those able to identify analytics obstacles are highly desired. Key being, SEO is as concerned with what analytics is tracking as it is about what analytics should be tracking. Posted in analytics, design, Google, online marketing, resources, Search, search engine optimization, SEM, seo, Uncategorized and tagged analytics, Google, seo on October 28, 2009 by Brian Ussery. 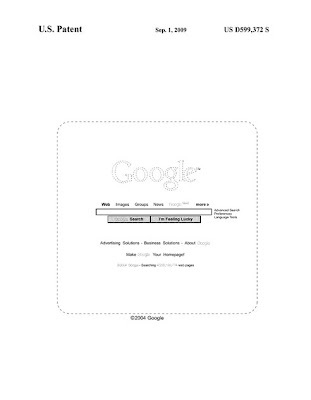 It appears as though Google's recently patented GUI design is live. Notice the larger buttons and text box? 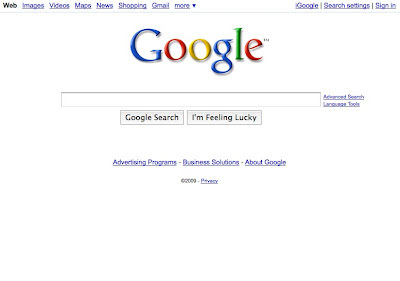 Posted in design, Google on September 9, 2009 by Brian Ussery. Before discussing the results of my case studies and how to optimize an actual scenario Flash site, it's important to understand some crucial background information. Before looking at how to optimize an actual scenario site, it's important to establish the new "laws of the land," so to speak. For that reason, I've conducted a number of experiments with various sites but have included only a few case studies below. These case studies lay a foundation in terms of understanding how Googlebot now interacts with Flash since Google's new algorithm for Flash was introduced. For demonstration purposes, I've used Google's example from Google Webmaster Central Blog. Experiment: To determine if Google associates text content embedded in Flash inside an (X)HTML page with the correct "parent" URL as a single entity. Hypothesis: Google currently still does not associate text content in Flash with the correct parent URL or as a single entity. Procedure: To test their claim, I used Google's example query [nasa deep impact animation]. Since the introduction of support for SWFObject in July, Google hasn't associated text content in Flash with the correct parent URL or as a single entity. More often than not, either the Flash URL or both the Flash and parent URL are indexed. *For test validity, I've monitored Google SERPs (search engine results pages) for the above query daily over a period of 60 days. I've also monitored Google's SERPs for the following queries over the same period of time: [deep impact amy walsh] and [deep impact impact with comet Tempel 1]. Experiment: To determine if Flash files can accrue PageRank. Hypothesis: Flash files can accrue PageRank. Background: In a recent interview with Eric Enge, Maile Ohye mentioned that links in Flash function as a regular links and, therefore, can pass PageRank. If links in Flash can pass PageRank, it seems they could also accrue PageRank. Procedure: Again using Google's example, I visited both the parent and child URLs and recorded their "Toolbar" PageRank. The (X)HTML parent URL page has a "Toolbar PageRank" of 7 while the Flash file URL (.swf) page has a "Toolbar PageRank" of 6. Flash files can accrue PageRank independent of their own parent URLs. *Note: The illustration in this case study shows both the parent and child URLs indexed as unique individual entities in Google's SERPs (search engine results pages). This further supports the findings in Case Study #1. Experiment: To determine how Googlebot handles URLs containing #anchors (fragment identifiers). Hypothesis: Googlebot ignores #anchors (fragment identifiers) in URLs and, as a result, extracts only URLs preceding #anchors (fragment identifiers) in Flash embedded links. Background: According to Google's own JohnMu, "When we find URLs with an anchor attached like that (http://domain.com/page#anchor) we generally ignore the anchor part, since it is not relevant when fetching the contents of a URL." While this is a convention commonly used for playhead control in Flash sites, it refers to the same page as defined by W3C. Procedure: To test the experiment, I used Google's "inurl:" operator to search for instances where Google had indexed a URL containing a pound sign. The queries I used are [inurl:#] and [inurl:& # 35;]. Google doesn't index URLs containing #anchors (fragment identifiers) in Flash per W3C Guidelines. Experiment: To determine if Google can translate text content in Flash. Hypothesis: Google can not translate text content in Flash. Background: "Google's mission is to organize the world's information and make it universally accessible and useful." To some, "universal accessibility" would imply translation. Procedure: To test the experiment, I used Google's translation tool to translate the case study example into French, Spanish, Chinese, Arabic and Russian. Currently, Google doesn't seem to support translations of text content in Flash. Avenues for optimizing Flash differ, but the final destination remains the same in terms of organic search engine optimization. The scenario below reveals the basics of how Flash sites are typically optimized. In addition to the description, I included images to help further illustrate the dynamics involved. While the scenario above seems fairly simple, understanding how each element is "digested" by Googlebot is a bit more complex. Here are a few issues to be aware of when optimizing Flash sites in light of the new Flash algorithm. As Case Study #1 and #2 illustrate, Google may not associate text content in Flash with the appropriate parent URL and/or as a single entity. This makes it possible for users without Flash-enabled browsers and/or devices (iPhone) to access Flash files directly from Google's SERPs. This issue can result in a bad user experience. If a user posts a link to domain.com/photos.html#/contact.html, Googlebot will only see and index the content at domain.com/photos.html. As illustrated by Case Study #2, Flash files can now accrue PageRank independent of their own parent URLs. As a result of this issue, PageRank thinning is likely to occur, because PageRank is divided between the parent URLs and actual URL. The percentage of thinning is likely to increase in proportion to the quantity of underlying (X)HTML pages containing "the flash file." Similar to PageRank, keyword relevancy may not be allocated to the intended URL. When keyword relevancy that is intended for one URL is instead allocated to another URL, thinning occurs. As Case Study #4 illustrates, Google doesn't seem to translate text content in Flash files, especially when text is supplied by a server or some other third party source. Before talking about SEO for Flash, it's important to define what that really means. Ask a Flash guy what SEO for Flash means and he might say something like "indexed content" or "indexation." Ask an SEO guy what SEO for Flash means and he might say something like "ranking top 10 or text content in Flash." As you can see, there are two different definitions and, therefore, two totally different expectations at work here. To an SEO, indexed content is the starting point where SEO for Flash begins. Simply "being indexed" is better defined as "Search Engine Friendly" (SEF). The introduction of Google's Flash algorithm means most Flash sites are, by default, search engine friendly assuming text content resides within the Flash files and isn't in a vector format. Organic search engine optimization (SEO), unlike search engine friendliness (SEF), depends heavily on "meta data," not just "meta tags." Lots of information can be gleaned from (X)HTML by search engines via, TITLE elements, ALT attributes, images, headers (H1, H2, H3, H4...), internal link structure, fonts, link popularity, relationships, site categories, subdivisions and sections. Engines rely on these elements for meta data as well as other informational "signals" used for rankings. "More data is good data" but only when that data is available in a digital format that's digestible by search engines and can be translated to determine relevancy for textual queries. As Vanessa Fox recently pointed out, the lack of structural meta data in Flash is a real disadvantage. With Google's introduction of "Universal search" in May 2007, Flash sites were dealt a new obstacle. Universal blends results from verticals like news, images and YouTube, in Google's search results. The advent of "Universal search" is somewhat problematic for Flash sites, because Googlebot can't extract images and/or video embedded in Flash for inclusion in Google's "Universal" search results. To illustrate, currently Adobe.com doesn't rank top ten in Google Images for [Adobe] or [Adobe logo]. Since "optimizing Flash" is difficult, it's better to understand the fundamental limitations of the medium in terms of search, and to then concentrate on optimizing site design and architecture. Avoid using text content in Flash for pages employing "seamless transitions" where URLs don't change, or, instead, include "pound signs"
The latest Google Webmaster Central Blog post includes lots of great information for webmasters as well as a new video which address some issues related to Flash but, not my findings. So, I've asked for details via Google Groups. I'll be talking more about these and other issues related to SEO for Flash at SES Chicago. Posted in design, Flash, Google, Googlebot, Innovation, PageRank, seo, SWFObject and tagged Adobe, Flash, Google, seo, SWFObject on October 13, 2008 by Brian Ussery.